The rack room, engineering room, technical operations center, frame room, whatever it is called, is a central part of any radio station studio facility. 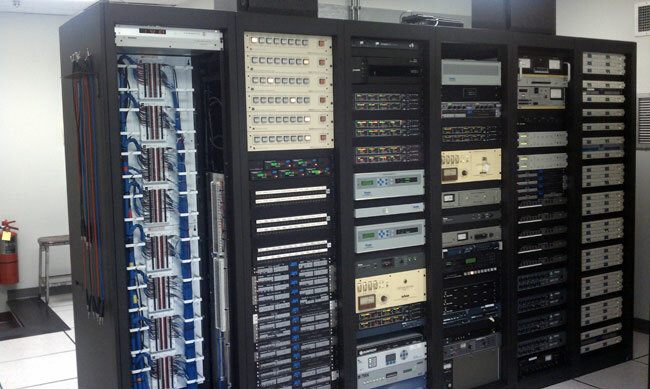 Normally found in a rack room are things like computer servers, switches and routers, structured cabling, telephone equipment, audio routing equipment, audio processing equipment, satellite receivers, wire termination blocks, microwave transmitters and receivers, and sometimes even broadcast transmitters and phasors. 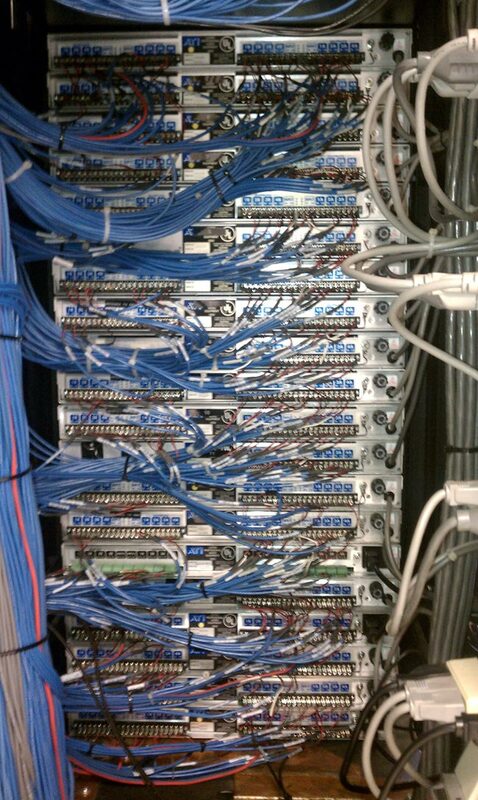 This is a rack room for one of the clients we service. This particular facility has 6 FM and 2 AM radio stations. Several stations share the same programming, however, so more accurately, there are four formats, thus four air studios, and four production studios. The station uses AudioVault 100 for it’s audio playback and automation. 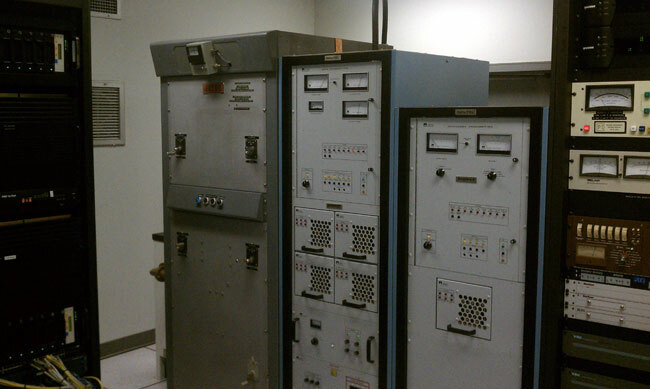 It is probably one of the few AV100 systems still in use. 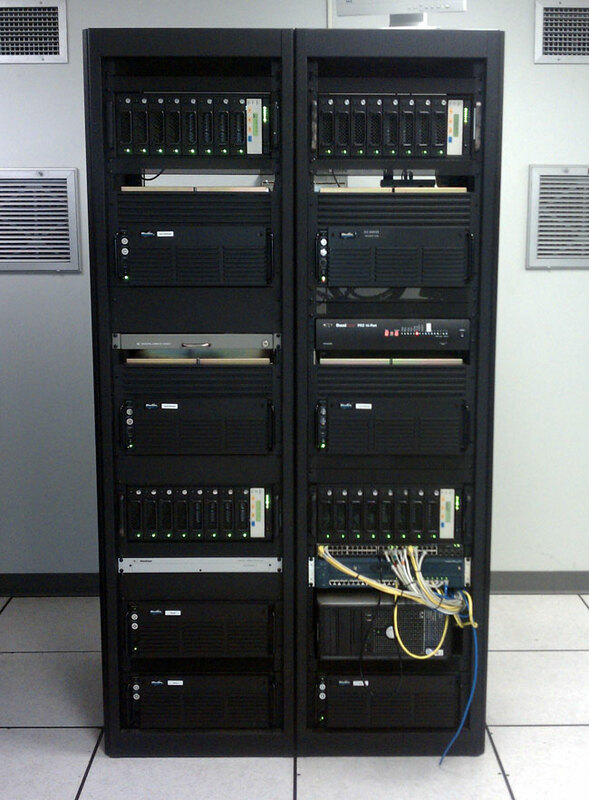 There are four servers and drive bays mounted in two racks, right next to the 5 KW AM transmitter. Doesn’t seem to be an issue. The studio is also co-located with one of the AM station’s transmitter site, which is always creates a special set of engineering problems. The antenna array consists of two 90 degree towers phased 210 degrees, which creates a figure eight pattern to the north and south. The studio building is in one of the main lobes of the antenna system. This means extra grounding is needed in the rack room and special attention needs to be paid to things like phone wiring and computer network cabling. This facility uses shielded Cat5E, which seems to take care of any stray RF. Of course, all the audio is balanced and properly terminated. For audio distribution, ATI DA416 audio distribution amps are used. These are used to distribute the air signal, the program and audition audio, the satellite feeds and remote broadcast feeds. Future wiring work will needed, there is no way that an engineer can plan for every contingency. It is difficult to plan one or two years ahead, much less five or ten. Keeping the wire conduits, raceways, trays or troughs accessible is key to a happy existence. This can be done by using overhead trays or raised floors and good cable management. Ground everything to a single point ground buss. There is no such thing as too much grounding, so long as everything is bonded together. Be sure to include TELCO and service entrance grounds. Have direct paths outside to accommodate STL transmission line, satellite cabling, etc. If those antennas are located on the roof, have a roof access in the rack room. Environment directly impacts the life of equipment. Keeping the rack room environmentally isolated from the rest of the facility is highly desired. HVAC systems should be sized for the highest equipment load on the hottest day of the year. Having some type of back up air conditioning is also a good idea. Leave plenty of room to work behind racks or on the wire wall. Cramped spaces create mistakes. Make sure there is plenty of light to work, lack of light also creates mistakes. Reserve some space for future growth. Extra room on the back wall for more punch blocks, extra space for additional racks is always a good plan. Keep the wiring neat and documented. There is nothing worse than an undocumented engineering room, it makes life difficult and in many cases, will eventually knock a station or two off the air when a wire gets snipped or pulled out. Make the room secure. Keep the doors closed and keep unauthorized people out. There are two conventions of though when it comes to rack planning. The first is that all like equipment should be mounted in close proximity. It is easier to run all the STL transmission lines to one rack, all the satellite cables to another, etc. Then there is the “rack assigned to a station” method, where each station has one rack with all of it’s processing, STL, EAS and other equipment in it. I prefer the first method, as it makes the room look more uniform, your mileage may vary. When done right, engineering rooms can be a great center piece to any facility. It is very impressive to take a client through the studio building and end up with “And this is the heart of the facility, all the radio stations run through this room…” Several larger facilities have glass walled rack rooms for just that purpose. It can be a positive attribute when everything is buttoned up.